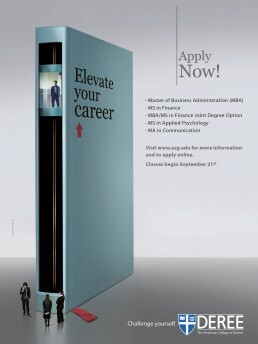 A series of print ad campaigns for Deree | The American College of Greece. 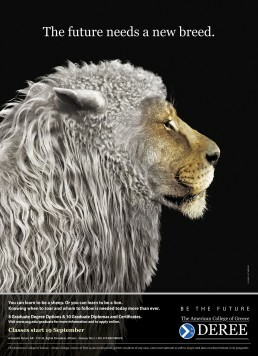 We where assigned by Mullen Lowe Athens agency to create the key visuals for 3 campaigns and design their print ads. The key visual of the first ad (slide 1) was the most challenging because we obviously couldn’t arrange for photo shoot with a lion and a sheep. We had to spent lots of time to find suitable photos with similar light conditions in order to create a convincing result. Then we used Adobe photoshop to blend the 2 photos together and enhance the visual with extra drawing. For the second ad’s key visual (slide 2) we took photos of a coffee bean, sea sponge and a dumbbell. The brief was to shape human brains out of these items and this is what we did. 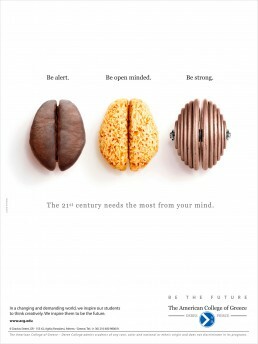 Apart from the coffee bean which looks almost like a brain, we manipulated the sea sponge and the dumbbell in photoshop. Finally, in the last ad (slide 3) we took a photo of a book, found slides of business class people in the position we wanted and other elements to create the elevator, followed by lots of drawing in photoshop.